Before the charismatic John Duval Gluck, Jr. came along, letters from New York City children to Santa Claus were destroyed, unopened, by the U.S. Post Office. Gluck saw an opportunity, and created the Santa Claus Association. The effort delighted the public, and for 15 years money and gifts flowed to the only group authorized to answer Santa’s mail. 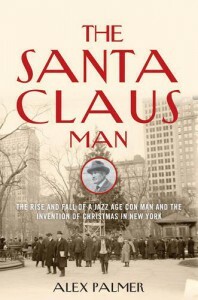 This book is not only about John Gluck and the Santa Claus Association but also about New York City history. There are stories involving stolen art, phony Boy Scouts, a kidnapping, pursuit by the FBI, a Coney Island bullfight, the country's first citywide Christmas tree and Macy's first grand holiday parade. This seasonal read is perfect for Santa Claus lovers and history buffs.